It isn’t unusual, in fact it is commonplace, for Sterling Systems & Controls, Inc.’ equipment and controls to be upgraded and enhanced over years of operation. Mechanical equipment gets replaced or added, the process changes and/or expands, and technology continues to evolve, usually for the better making things more cost effective and efficient. Automation is no exception. Automation upgrade is often performed after several years or when an event may necessitate it. In addition, it is not unusual for companies to begin with a small modular system, like batching with four (4) ingredients let’s say, and then expand over time adding more ingredients and formulas. Sterling Systems & Controls is experienced and very accomplished at assisting customers through the evolution of their process, equipment and systems. The evolution of automation especially is something that tends to get upgraded over time. Automation technology changes fairly quickly so that the state-of-the-art today is not the state-of-the-art in another year or two. Those companies involved with designing and creating automation systems and capabilities are constantly keeping in touch with changes in hardware and software standards and tools. 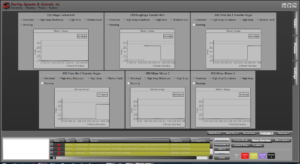 Let’s take a look at an example of an automation upgrade over time. A decade or so ago Sterling Systems was approached and asked to come in and replace an existing batching system (by other manufacturer) by a large cattle feeder operation. The reason Sterling Systems was brought in was because of the absence of support from the previous system supplier, as well as some performance issues. The application was a cattle feed operation with blending and mixing of both liquids and solids to feed a mixer and produce the final feed end product. 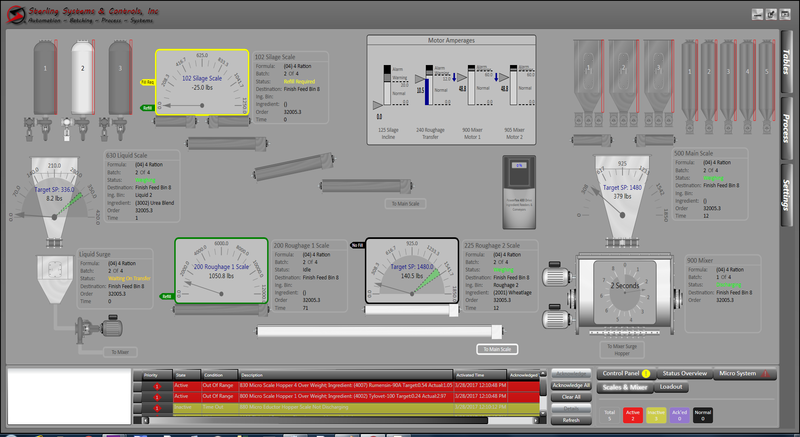 Sterling Systems proposed a customized seven (7) scale Batching Control Software System with interface to existing control panels, PLC hardware and the PLC network for the customers’ feed yard weighing and mixing equipment. No wiring changes were anticipated, and the proposed new software system was based on what Sterling Systems had done at a different customer location for a similar application, the basics of the system design had been proven. 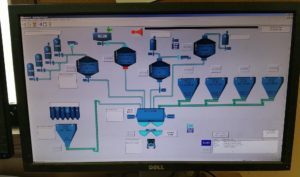 The replacement batching system software that Sterling Systems’ ended up supplying utilized a Desktop PC (supplied by customer) running Sterling Systems’ new (at the time) Windows based Batching Software. The PC was connected to the existing customer Control Panel(s) that houses the Programmable Logic Controller (PLC) and the PLC provided Input/Output (I/O) interface to the field devices. The existing manual Control Panel enclosed the seven (7) weight indicators and panel mounted switches for manual back-up capability. The batching system incorporated standard batching features such as the multi-tasking capability that allows the system to batch while editing or checking formulas, formula creation, ingredient tracking, ingredient inventory/usage and other main menu functions. One major benefit of the Sterling Systems batching system, per the customer, is that it produces batches faster than the previous suppliers’ batching system! Computer Equipment Rack containing one (1) new Main Batching Computer, one (1) new Server Computer and Console, two (2) network switches, and one (1) battery backup unit. New Allen Bradley PLC with required I/O modules. Replacement doors for existing enclosures that will have new Allen Bradley PanelView+ touchscreen and ten (10) new scale indicators mounted. This is for the upgrading of the existing Manual Panel that was installed by others. This also increases the number of scales from the original seven (7) to ten (10) as more dry materials were being added to the batching formulae. New Ethernet I/O Panel for new Grinding Equipment. New Grinding/LIW Panel with Allen Bradley PanelView+ touchscreen for control of new Grinding Equipment. With the new PC came the upgrade from Sterling Systems’ legacy batching system software to the current state-of-the-art using Microsoft .NET. .NET is a framework that runs on the latest Microsoft OS’s and provides programming guidelines that can be used to develop a wide range of applications, in this case the Sterling Systems batching system software. 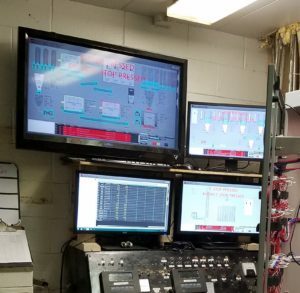 Also included in the automation upgrade for the new system was a host of upgrades including grinder monitoring, and a supervisory remote control application called WebCentral™ Supervisory Control. WebCentral™ is a software package that allows corporate users to access the database of a Sterling Systems & Controls, Inc. batching control system. This can be used to enter and manage all configurable items remotely using a PC’s web browser. Sterling Systems & Controls, Inc. can design and manufacture customize automation systems and process controls to replace other brands and we provide premier support to be with our customer for the life of their business resulting in improvements in product efficiency, and providing the upgrade of technology and growth of the automation system as required by the customers’ expanding process and business. Call us today! 815-625-0852 Or email us at sci@sterlingcontrols.com to discuss what we can do for you today.